At Remembrance Day 2017, in the Rangoon War Cemetery, veterans, military personal from around the world, diplomats and other interested parties gathered to remember those who had fought in Burma during the Second World War. At the beginning of 1942, alongside the Japanese Imperial Army, the Burma Independence Army (BIA) marched into Burma to drive out the British and gain independence. Within Burma, anti-British sentiment was rife, and the BIA picked up many Burmese (ethnic ‘Bamar’) recruits, many of whom went on to commit appalling atrocities against those who continued to support Great Britain and its Allies against the Japanese. The unprepared British forces suffered successive setbacks. They evacuated Rangoon in March 1942 and had retreated over the Indian border by May. Many of the ethnic races within Burma, those from the border territories who the British had treated favourably in comparison to the Bamar majority, such as the Karen, Kachin, and the Chin, remained loyal to the Empire throughout the war. As the British left, the majority of these ethnic minority soldiers were ordered to return to their villages, conceal their weapons and be on guard and ready to fight when the British returned. Major Hugh Seagrim, a British Officer in the Indian Army, also remained in Burma, camping out with his Karen troops in the jungles of Burma. He led these guerillas in a successful campaign of sabotage until, after a concentrated Japanese manhunt, his forces were almost completely wiped out. To prevent the ensuing torture of prisoners and attacks on Karen villages, Seagrim surrendered himself. Taken captive not in British uniform but in Karen dress, there was no question of the sentence. Seagrim was shot by the Japanese as a spy in 1944. Particular attention was devoted to Seagrim in Yangon last November. After the ceremony at Rangoon War Cemetery, a plaque commemorating him was unveiled at the Holy Trinity Church in the centre of the city. As brave as Seagrim was, the Karen he fought alongside were in many ways doubly heroic. In many cases the Japanese and Burmese forces were in possession of their homes, and often their families too, and at this point in the war the chances of a victorious British return were slim. Beyond their affection for the British, there was the added incentive for the ethnic minorities of Burma - and especially the Karen - to fight for the Allied Forces. There was much animosity between the Bamar and the ethnic minorities; something that had been exacerbated (and exploited) under British rule. The Karen wanted to govern their own autonomous state if and when the British left, and unofficial promises were given to them by the British that they would be supported in this if they fought alongside the Allies against the Japanese and the BIA. And yet, the realities of politics did not prove favourable to the Karen. The British handed over the country to the Burmese in 1948 and left their wartime allies to fend for themselves. The Burma Campaign, and the native soldiers who fought alongside the Allies, were soon forgotten in London. The country faded from British consciousness as it descended first into the quagmire of civil war, and then into outright dictatorship, disappearing behind a bamboo curtain. And yet, these veterans have not been forgotten by everyone. Alongside Davies and the soldiers at Remembrance Day in Rangoon last year, was Sally McLean, founder of the small British charity Help for Forgotten Allies (H4FA). H4FA provides grants and supports these veterans who fought alongside the British in the Second World War. Many of these veterans and their families have been caught up in the conflicts that have wracked Burma since independence, scores driven to refugee camps on the Thai-Myanmar border. Others remain scattered in jungle and atop mountains throughout the country, often suffering appalling treatment by the Burmese military. Sally’s involvement with the Karen and other refugees from Burma started over twenty years ago when she first went to visit some of these camps in the mid-1990s with the organisation Christian Solidarity Worldwide. “It was me being moved to do something rather than just reading about it,” she said to us. “And I thought, I’m not going to just go along as spectator, that would be pointless and voyeuristic, I am going to raise some money. "Living among the dying and demented at the hospital - a rather grand term for what is little more than a large hut - was Saw Yoshoo, an old soldier who turned out to have been a pupil of my grandfather, headmaster of Government High School, Maymyo, Burma, who had to flee the Japanese advance. This meeting spurred her to approach the Royal Commonwealth Ex-Services League (RCEL) who then took on the responsibility of granting money to veterans such as Saw Yoshoo. When this was discontinued in 2007, Sally, alongside Colonel Sam Pope - a former Secretary General of the RCEL - founded H4FA to raise money so that the grants could continue. A fellow trustee of H4FA is Peter Mitchell. Peter’s father had fought with the Royal Artillery in Burma during the Second World War and had known Hugh Seagrim from their school days together in the 1930s. Peter himself later joined the Royal Artillery in the 1960s and was stationed in Malaysia / Singapore with the 28th Commonwealth Brigade. Since becoming a trustee of H4FA in 2013 he has travelled to Myanmar four times and visited the Tiddim Road in Chin State where his father fought. The Chin people were loyal allies of Britain throughout the war, and it was because of his father’s admiration for Seagrim and the Karen, Chin and Kachin that Peter chose to join Sally as a trustee. Through Peter’s son, he and Sally were introduced to Alex Bescoby, co-founder of the production company Grammar Productions, who at that time were working on their film “We Were Kings” about the descendants of Burma’s last royal family. Gradually the idea came about for Grammar Productions to make a film about the veterans that H4FA were helping. In Autumn 2017, Grammar Productions joined H4FA on a trip to visit these veterans in Chin, Kayin (Karen), and Kayah States. Sally lightens as the talk turns to her trip with Grammar. Fun though the trip may have been, it was also poignant. The mission of Help for Forgotten Allies is in its twilight days. As these veterans enter the last years of their lives, the charity’s job is almost done. Above and beyond raising money for these men, the raison d’etre of the film “Forgotten Allies” is to record these stories before it is too late. Duncan’s family lineage is even more close to the exploits of the ethnic veterans. His grandfather was Colonel Peacock who led one of the largest operations of the Special Operations Executive (SOE) in the Burma Campaign. Peacock had initially worked in Burma for over 20 years in the Forestry Service, eventually rising to Deputy Conservator of Forests. When the Second World War broke out Peacock was 52. He lied about his age at the recruiting office and was conscripted as private into the Royal Artillery. He was soon moved up to Sergeant and later became Lieutenant, recruited to give lectures in jungle warfare in Karachi just after the British had been driven out of Burma in May 1942. He was brought to the attention of the Special Forces Executive, the forerunners of the SAS, and he was sent up to operate in Imphal Region where the Japanese were threatening to pursue the British into India. There he trained and worked alongside many who went on to do great things in the Burma Campaign. He became one of the main commanders of SOE, known as Force 136 in Burma, whose mission it was to get behind the Japanese lines and cause as much disruption as possible. Peacock, at this point Colonel, led Operation Character, one of the largest SOE operations, commanding 80 British officers and around 12, 000 Karen guerillas. Initially, when the Japanese reigned supreme in the jungle, the main thrust of Force 136 in Burma, was to get into the ‘guts’ of the enemy and sabotage their lines of communication. As the war moved on and the Allied Forces pushed onto the offensive, the focus of 136 shifted to protecting the Fourteenth Army as they advanced towards Rangoon. And successful it was. At the time of its conclusion Operation Character had accounted for nearly 11,874 Japanese dead for just 22 of their own, a kill ratio of 545/1. The thousands of Japanese still in Burma were a scattered bunch, with many trapped and falling victim to disease in the hills around Pegu (Bago), east or Rangoon. The atom bombs were dropped in August, and Tokyo surrendered in September, bringing the war to a close. However for the Karen, any end of war celebrations were short lived. The messy world of politics soon began to infringe on the relationship of wartime allies as the British prepared to leave Burma in as orderly a fashion as possible. The Karen were confident in British support for an autonomous Karen state within the Commonwealth. However the new government in London under Prime Minister Clement Attlee was instead edging towards the idea of a unified Burma under the premiership of General Aung San, who had led the BIA to defect from the Japanese to join forces with the Allies in March 1945. In July 1947 the Karen National Union formed its military wing, the Karen National Defence Organisation, and the following month declared independence from both Britain and Burma. When Burma officially gained independence from Britain in January 1948, the country quickly descended into war once more. The conflict between the Bamar and the Karen was fierce, coming to a head at the Battle of Insein in January 1949. The Karen were on the cusp of taking Rangoon but were unable to secure the airport, allowing the Burmese Army to continue bringing in reinforcements until the Karen were pushed decisively back. The Karen continued to fight throughout the first decade of Burmese independence. Things only got worse for them when the country slipped towards dictatorship after the coup of General Ne Win in 1962, as Karen communities continued to be targeted by the Burmese Army. It was into this context that Sally first began engaging with the Karen on the Thai border. "You white men will ride the Karen people like a horse. But when you leave, the horse will have no rider and no stable." Before the fairy disappeared, Seagrim gave his promise that the British would never abandon the Karen. Despite the years and despite the perceived betrayal by the British, Help for Forgotten Allies have witnessed a tenacious memory in the elderly veterans they have met. One veteran that H4FA have been supporting is Saw Tun Thein who fought under the command of Colonel Peacock. Burma was a complicated country when the Japanese invaded, and it is only more complicated today. Help for Forgotten Allies is not in a position to build peace. And nor, for that matter, is Sampan Travel. But what we can do, those of us living here, and those of us who visit, is to listen. 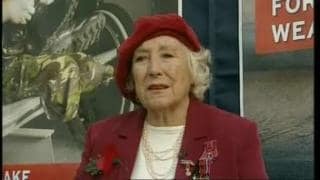 Dame Vera Lynn, the Forces' sweetheart, has received her latest honour from the Queen in an investiture ceremony held at her village home. The 99-year-old, whose songs brought hope during the darkest days of the Second World War, was made a Member of the Order of the Companions of Honour in the Queen's Birthday Honours list. She could not make it to Buckingham Palace and received the accolade - for nearly eight decades of service to entertainment and charity - at an investiture ceremony at her home in Ditchling, near Brighton, on Wednesday. Dame Vera, who turns 100 next March, said she was "truly delighted" to be made a Companion of Honour. She said: "In accepting this award, I do so in remembrance of all our wonderful brave boys who made the ultimate sacrifice for our freedom, and also in honour of all the children affected by cerebral palsy." Led by Peter Field, the Lord Lieutenant of East Sussex, family friend Carola Godman Irvine, who is the county's deputy lord lieutenant, read the citation which saluted Dame Vera for being "the voice of hope" during the Second World War. In her 20s, Dame Vera played a huge role in keeping up the spirits of a British civilian population suffering under the Blitz. She travelled thousands of miles, often at great personal risk, to entertain troops. Her hits included We'll Meet Again, I'll Be Seeing You, Wishing and If Only I Had Wings. In 1941, she was handed her own regular radio programme, Sincerely Yours, giving her a peak-time evening audience. When the war was over she retired from the stage and microphone to bring up her daughter, Virginia, at their home in Sussex, but she remained in demand. She toured throughout the world, visiting the US, Scandinavia, the Netherlands, Germany, Canada, New Zealand and Australia. Dame Vera once said: "I have never been terribly ambitious. I never wanted to be a Judy Garland or anything, and I wouldn't change the way I used to sing. "If work came along I liked, I would do it. If it interfered with home life for too long or took me away, I wouldn't." 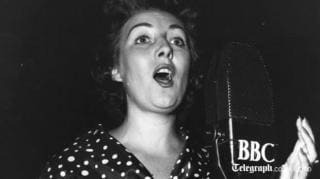 In 2002, she founded cerebral palsy charity the Dame Vera Lynn Children's Charity, based in Billingshurst, West Sussex, which provides support and education for affected families. She is involved with many other charities throughout the UK and beyond. She has received accolades throughout her life, including an OBE in 1969, a DBE in 1975, and in 1978 she was given the Freedom of the City of London. YANGON -- Perhaps for the last time, the old Karen warriors gathered around the grave of a World War II British officer they called ''Grandfather Longlegs,'' and in poignant harmony sang a Christian hymn to fulfill his last request made decades earlier before Japanese soldiers took him away to an execution ground. Seven decades after the conflict's end, in the remote hills and frontier refugee camps of eastern Myanmar, Major Hugh Paul Seagrim remains a legend and inspiration among the Karen, one of the country's downtrodden ethnic minorities. But Seagrim, an eccentric mystic and brilliant guerrilla leader who gave his life to save his comrades, is almost unknown in his homeland, as are the Karen who fought alongside the British only to be abandoned after the war. "We have never stopped praying for him because he loved our people,'' said Saw Berny, who fought with Seagrim deep behind Japanese lines. Wheelchair-bound but still spry of spirit, the 92-year-old veteran looked down on Seagrim's grave during a ceremony last year to mark the 70th anniversary of the war's end. Around him at Yangon's beautifully manicured Commonwealth War Cemetery were gathered 20 of his former comrades-in-arms, along with Sally McLean, a soft-spoken, unassuming British woman who has made it her mission to aid the mostly impoverished Karen veterans and bring the life and heroic death of Seagrim before the general public.